Ask fellow campers about "Kentucky Alleyne Provincial Park" and nearby attractions. 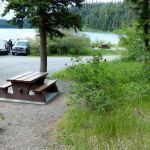 This provincial park is located east and south of Merritt BC and is next to a small lake. 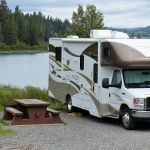 There are a number of small campgrounds in the area beside different lakes. Our site looked out over the lake and was a sunny spot so our solar panels worked well. Most of the sites are small and narrow so locating our truck and trailer was challenging. The only services are a water tap, garbage bin, and pit toilet. The main drawback were the hordes of mosquitoes. They were so bad that after one night we decided to leave even though we had planned to stay four nights. We camped at Kentucky Alleyne Provincial Park in a Travel Trailer. The only activities are boating, fishing, hiking, reading, and resting. There is no radio, TV, or cell service. This dry camping at its best. This park is quite far away from any urban area. It is quiet, serene and the lake views are very nice. Access from the highway is a paved road that is somewhat narrow. There were a few places that could be a problem if two large units met. Traffic is sparse though. There is no check in. Find a vacant spot and the Camp Host will visit and collect your "cash". This is NOT big rig friendly. We have a 28 foot Class A and tow a Jeep. We had to disconnect in order to maneuver. As others have mentioned there are three areas. We stayed in the "Middle" area overlooking the middle lake. We had a pull through that was a little unlevel. There are no "services" at any of the sites. Standard generator rules are enforced (9:00AM - 11:00AM and 5:00PM until 7:00PM only). Interior roads are paved and sites are coarse gravel. A table and fire pit are standard. Firewood is available from the Camp Host. A fire ban was in effect so there were NO wood fires allowed. Propane fire rings were acceptable though. There are no street lights of any kind around so the stars were amazing. There is no over the air TV, no cell service, no internet. Satellite would be available at most sites. Trails link all three sections of the park. Restricted boating is allowed and the lakes are stocked with trout. The middle lake fishing is for children only. We would like to come back in the fall when the nights are cooler and foliage will be turning color. We paid $18.00 Cdn per night inc tax and feel we paid a fair price. We will return. We camped at Kentucky Alleyne Provincial Park in a Motorhome. The closest services are in Merritt from the west and West Kelowna to the east. This is a place to come with family to enjoy nature or a quiet rest from the city. This park has individual campsites at both Kentucky and Alleyne Lake and one of the ponds in between the two lakes. There is also a group camp at the north end of Alleyne Lake. We chose to stay at Alleyne Lake in site 49 which had a great view of the lake. From our rear bedroom window we could see deer browsing along the lake and Canada Geese with their goslings. Our site was a gravel back-in that sloped downhill, so it needed some leveling in the back. It had a picnic table and a fire ring. The picnic table was in sad shape with the stain peeling off and one of the bench planks rotten. Other BC provincial parks we have stayed at this year all had well maintained picnic tables, so I hope they get around to doing the same here. Some sites here are not as private as in most other BC provincial parks, although most were. There are pit toilets in several areas. No dump station. I noticed a portable generator powered the pump house near the pond sites. The continuous noise from the generator was noticeable from the closest campsites. There are two boat ramps, one on Kentucky and the other on Alleyne. Only 10hp or less boats allowed on the lakes. The ponds had kids only fishing. The access road to the group camp had a washout from recent rains. There are trails between the lakes and ponds and one around Kentucky Lake. Kentucky has a primitive beach area as well. Not that many sites that I would consider big rig friendly. No OTA TV, but some open sites such as our site would be able to get satellite TV. We would consider staying here again if in the area. We camped at Kentucky Alleyne Provincial Park in a Motorhome. The campsites in this park are split between Kentucky Lake and Alleyne Lake, with a few in between. We stayed at one of these in between spots that was a pull-through and had a great view of the east pond. If you like to fish this is your park and you'd probably want one of the sites nearer to one of the lakes. It was cool at night when we were there in September but the sun was warm so the spots near the lakes being in the trees are a bit cooler than those in the open. We had a great time hiking around the lakes. Swimming isn't really practical because of the mud on the lake shore but the lakes look to be perfect for small boats and canoes. We will be back. We camped at Kentucky Alleyne Provincial Park in a Fifth Wheel. Are you affiliated with Kentucky Alleyne Provincial Park ?